The A2A has initiated a multi stage project to bring Conservation Action Planning to the A2A Region. This initiative has been supported largely through SEED grants from the Ontario Trillium Foundation. Description: What is Conservation Action Planning? Conservation Action Planning (CAP) is a method for planning, executing and evaluating environmental conservation initiatives within ecoregions. It is generally introduced when there is good scientific information available about a clearly identifiable natural area, and where overall conservation goals have been largely identified. However, it can also be introduced in natural areas with less substantial scientific information, in which case the CAP might include objectives involving further baseline inventory and research. CAP provides an adaptive, pragmatic management framework to support the development and implementation of concrete conservation actions. The framework is structured to emphasize results and continuous learning through on-going monitoring and assessment. The CAP framework is made up of four basic components: defining a conservation project; developing conservation strategies and measures; implementing the strategies and measures; and using project results to adapt and improve. This is the framework that is applied around the world in almost every type of ecoregion imaginable. The scale of a conservation action plan is flexible. Needs, resources, and capacities may vary from project to project within an ecoregion or natural area, and the CAP process can still serve as the primary planning mechanism. It can also be adapted to meet many different types of conservation goals, ranging from conservation of species, sites, ecosystems, landscapes, and watersheds, all the way to seascapes and marine areas. A wide array of outcomes from CAP activities is possible, varying according to: locally-developed consensus about a region’s needs; available resources; and existing knowledge and capacity. For example, target outcomes could range from specific site improvements, e.g., quantifiable reductions of invasive plant species, to the identification of gaps in scientific knowledge that can be addressed in subsequent conservation activities in a given CAP area. The CAP process emphasizes the importance of local involvement and local guidance and brings together local partners to set conservation objectives and strategies through structured information sharing, collaboration and consensus. CAP integrates place-based knowledge with evolving scientific understanding to drive the selection of appropriate conservation actions and to achieve specific outcomes. The CAP process asks participants to engage in a structured dialogue to identify what they want to conserve; their current best understanding of what constitutes “good health” for a given conservation target; and what the current conditions are regarding this target. These discussions lead to establishing objectives and specific actions to conserve a particular target. Each action is accompanied by measures that enable participants to assess progress, adapt and learn. The A2A initiative involves two stages. Stage 1, completed in 2017, has established an A2A lens or framework. This project builds on a successful 2016-2017 SEED grant project in which A2A developed a landscapescale "lens" approach to applying the Conservation Action Planning (CAP) Framework within the Algonquin to Adirondack (A2A) corridor. The goal is to pilot this lens approach while developing a local Conservation Action Plan and establishing the necessary process and evidence to apply our landscape scale Lens to multiple Conservation Action Plans across the A2A corridor. Conservation Action Planning represents a robust, repeatable and well- tested open concept planning process, building on existing local conservation efforts through stakeholder workshops that focus on opportunity and action. Applying the A2A landscape scale lens will place threats, targets, and actions within a regional context to ensure that local conservation action plans consider the bigger conservation picture. 3. 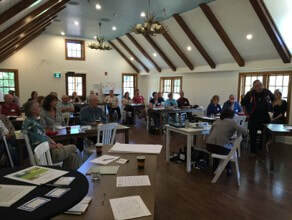 Local Conservation Action Plan workshops that incorporate the landscape scale work from stage 1. 4. Report production with CAP priority actions and implementation strategy. This work will apply and test the feasibility of the landscape corridor scale A2A Cap lens and process as developed through the work in Stage 1.